On New York City's First Avenue, two hospitals sit two blocks apart, but the scenes last week could not have been more different. In front of Bellevue Hospital Center, a dozen news vans clogged the street. Reporters jockeyed for position in front of the main entrance. They were gathered to cover the city's response to the region's first confirmed case of Ebola. Just north of the media spectacle, First Avenue was calm. 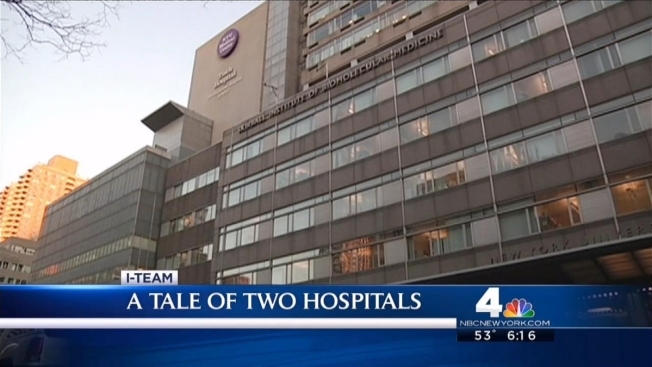 At NYU Medical Center, it was business as usual -- no crowds of journalists, no Ebola patient. The stark comparison raised uncomfortable questions about disparities in the way FEMA has treated the two hospitals in the wake of Sandy. Though Bellevue is New York's biggest public hospital and the first option in responding to public health crises, including Ebola, NYU -- a private medical facility -- has secured nearly 10 times more Federal Emergency Management Agency disaster aid. The federal government's $1.2 billion award to NYU is the second largest sum of disaster assistance in the history of FEMA Bellevue has been given $117 million. The city’s Health and Hospitals Corporation, which operates Bellevue and other public hospitals and clinics, predicted FEMA would soon approve a sizable disaster grant for the facility, but it's been two years since Sandy tore through -- and some critics say it is impossible to justify prioritizing a privately-owned hospital ahead of a publicly-owned one. “I find it inexcusable,” said Ann Bove, a Bellevue Hospital nurse who serves as Secretary of the New York State Nurses Association, a union that represents thousands of nurses at New York City’s public hospitals. Last August, Bove wrote a searing letter calling the imbalance of FEMA aid “unwarranted and unfair,” particularly because Bellevue treats far more uninsured and Medicaid patients than NYU does. “No matter if you have a nickel in your pocket or a billion dollars in the bank, if you get hit by a truck on First Avenue, you are not going anywhere but Bellevue,” Bove wrote. Emails obtained by the I-Team seem to show FEMA officials also had questions about using using vast sums of federal money to bail out a private medical institution, especially one with ample private insurance. On Nov. 9, 2012, less than two weeks after the storm, FEMA officials were considering a visit to NYU when Patrick Kenney, a deputy director of the agency’s infrastructure branch, expressed concern about whether the hospital could apply for public assistance. “As a private institution, [NYU] may not be eligible and should have insurance. I am OK with a visit, but do not want the expectation that FEMA funds could be available if the institution is not eligible,” Kenney wrote. Kenney did not respond to the I-Team’s request for comment. Private non-profit hospitals are eligible for FEMA public assistance but they may not use public funds to pay for damages covered by their insurance policies. In another email between FEMA staffers, Mike Beattie, an insurance specialist for the agency, raised questions about whether disaster aid for NYU might duplicate NYU's private insurance policy. Beattie wrote in December 2012 that the hospital's insurance policy appeared to have "very broad coverage." Beattie went on to list “building demo” and “flood remediation or muck-out” as "typically covered by insurance,” in which case FEMA funds should not be used. Beattie did not respond to the I-Team's request for comment. Through a Freedom of Information request, the I-Team obtained a copy of NYU’s global risk policy. At the time of the storm, the policy included at least $40 million in flood coverage plus $150 million in coverage for lost research, service interruption and so-called “soft costs” like consulting, architecture, and legal fees. The policy also provides for the reimbursement of 90 days’ worth of payroll. According to Lisa Greiner, an NYU spokeswoman, the hospital has recouped about $50 million from its insurance carrier to date. "FEMA and NYU Langone agreed that $29 million of the $50 million was attributed to recovery costs that were eligible for FEMA payment and this amount -- $29 million -- was offset to reduce the FEMA payments that we otherwise would have received," Greiner wrote in response to the I-Team's inquiry. Aside from private insurance monies, the I-Team revealed last year that NYU had an untapped $200 million line of credit when Sandy struck. The hospital's Board of Trustees also includes titans of the financial services industry like JP Morgan Chase CEO Jamie Dimon, Goldman Sachs President Gary Cohn, Blackrock CEO Larry Fink and Home Depot co-founder Kenneth Langone. Judy Wessler, a longtime advocate for public hospitals, called it "scandalous" that NYU has been first in line to get public disaster funds when the private hospital was already resource-rich and Bellevue's budget is strained. "The Health and Hospitals Corporation, which runs Bellevue, has a large deficit," Wessler said. "Whereas NYU has just gotten all this money and continues to function as if nothing happened." After Sen. Charles Schumer (D - New York) helped spearhead efforts in Washington to get more FEMA aid for NYU, Kenneth Langone held a fundraiser netting more than $200,000 for Schumer. Meredith Kelly, a spokeswoman for Schumer, said he has focused his efforts, not just on securing aid for NYU, but on Bellevue and all of the damaged facilities run by the City’s Health and Hospitals Corporation. "The only reason that NYU has received more FEMA funding than HHC thus far is that it took longer for HHC to submit its more complicated application," Kelly wrote in an email to the I-Team. "We are pushing very hard for HHC to receive what will be an additional award of well over $1 billion, and at the end of the day are certain they will get an amount of FEMA Sandy recovery money that is greater than what NYU has received." Mike Wade, a spokesman for FEMA, also suggested NYU received its award ahead of Bellevue because HHC submitted its application for aid months later. "NYU Langone Medical Center began discussions [with] the FEMA mitigation staff regarding appropriate mitigation projects early in 2013," Wade wrote in an email to the I-Team. "Bellevue and Coney Island proposals for mitigation projects were submitted in February 2014." HHC officials say their FEMA application includes $1.6 billion in requests for flood mitigation projects at four city-owned hospitals. They are Coney Island Hospital, Metropolitan Hospital, Cooler Hospital, and Bellevue. Bellevue’s portion would be about $471 million. The broad scope of the application, they say, required more time to prepare. Even if the federal government approved the entire request, NYU Medical Center will have won more FEMA aid than any other hospital in New York City. Brad Gair, a former FEMA official who worked on the HHC application for assistance and has since been hired as NYU's Senior Vice President of Emergency Management, said he does not believe NYU received any special treatment during its quest for federal money. "To the best of our knowledge, FEMA is continuing to work through a similar process with other Hurricane Sandy-damaged hospitals throughout the region," Gair wrote in an email to the I-Team. "That will ultimately result in a substantially more resilient health care system throughout the city and across the entire region."